I'll start this by saying yum, it was a very delicious challenge. I'm not always one for creamy sauces or mousses but these ingredients all worked together so well that I was happy to eat the various versions I put together. 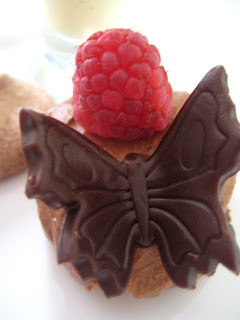 and finally tried out a deconstructed plated version, decorated with some gorgeous chocolate modeling paste butterflies. One of the amazing things about the Daring Bakers is how you can give a recipe to a group and everyone comes up with a different presentation. From the sneak peeks posted on the site, this particular combination seemed to allow everyone to showcase their creativity. 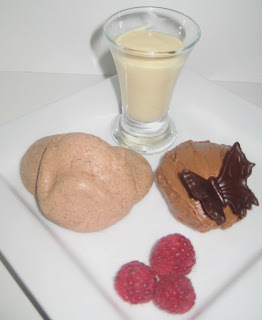 Thank you Dawn, this was a lovely challenge, I really adored the mousse and mascarpone cream. Beautiful creamy mousse! Mine was terribly grainy. 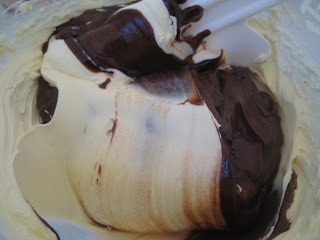 Maybe I overbeat the mascarpone? Your presentation is superb! I really love the butterfly. Brilliant! Your mousse worked out so smooth kudos to you. And your version of the challenge is so elegant brilliant interpretation love the berries also. Cheers from Audax in Sydney Australia. Your presentations are amazingly beautiful. Each of the elements looks tempting, then put together it looks irresistable! Great work on this challenge, and I look forward to seeing more or your artistry! Love the presentation - looks delicious. I love your interpretation of this dessert. It looks delicious! And your butterfly is awesome. I want to take a bite out of the wing! Great job on the challenge! Well done on the challenge Linda. Love all the different versions ... wow on the butterfly! Wow great looking pavlovas! I really have to try that chocolate modelling paste, it looks gorgeous! I'm definitely going to have to try layer desserts like that at some point they look fabulous ! Wonderful looking pavlova! great work! I liked all your versions, and the ones in the glass the best. The chocolate butterfly is so cute. Linda, I love the way you played with the various presentations. The butterfly is soooo beautiful! I would say your pavlova is "LINDA", which in Portuguese means "very beautiful"! Thanks for your comment on mine! Love the different ways you chose to preset your pavlova. And the addition of the butterfly makes it perfect. Wonderful job on the challenge! Oooh wow I love the look of your parfait pavlovas, they look delicious hehe! Yumm! 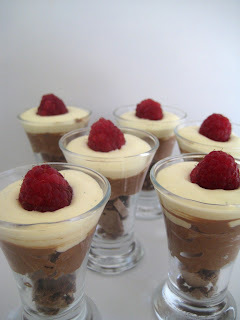 Hi Linda, your mini-pavlovas in glasses look so pretty!Great job! They all look wonderful, but I would especially like to dig into that parfait! Nicely done! Looks beautiful! I love the layers and the chocolate butterfly looks amazing! Nice job on the challenge. beautiful presentation!! your parfaits look delicious! Beautiful, you made the pavlovas look even lighter. The butterfly is so sweet, all the pictures are perfect. 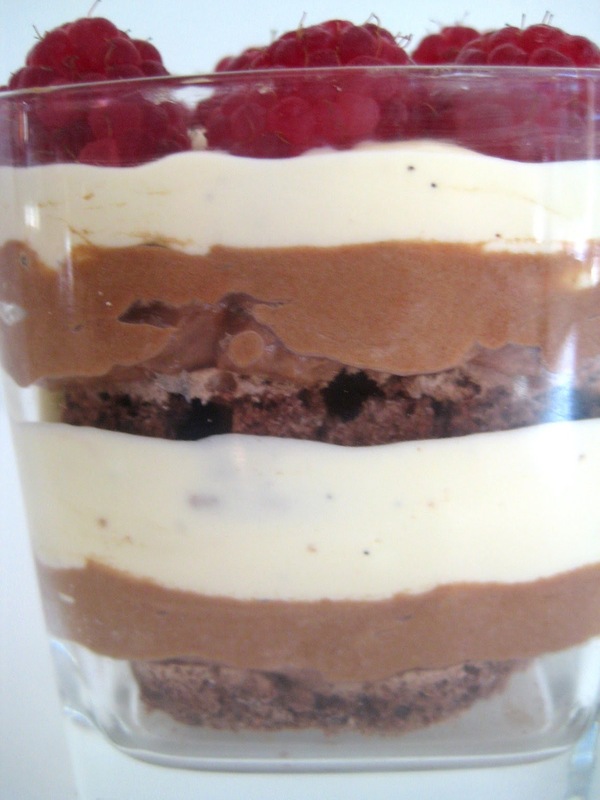 All fantastic pictures, but your first one especially will stay in my mind for a while... Now, THIS is a dessert. Great job! Nice presentation. They look great! 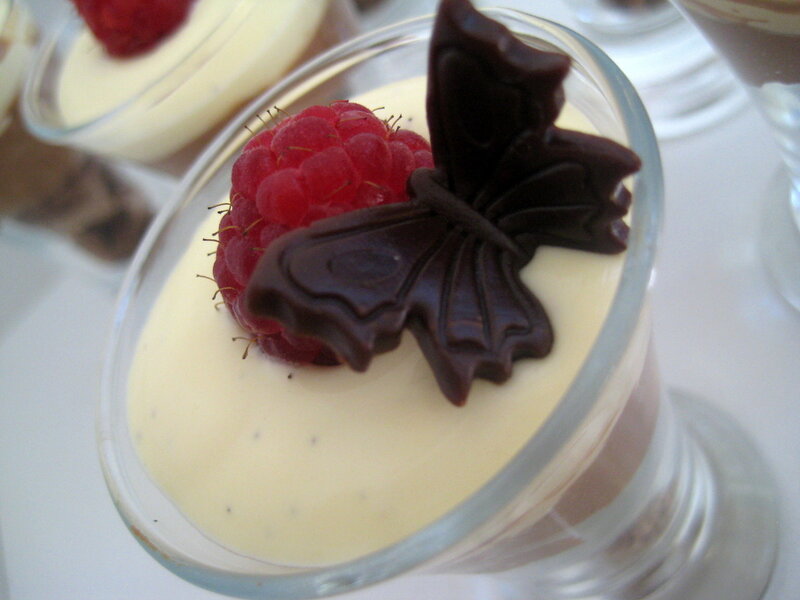 Gorgeous pavlova parfaits..the mousse is perfection and your presentations are stunning...especially with the chocolate butterfly! Beautifully done all around!